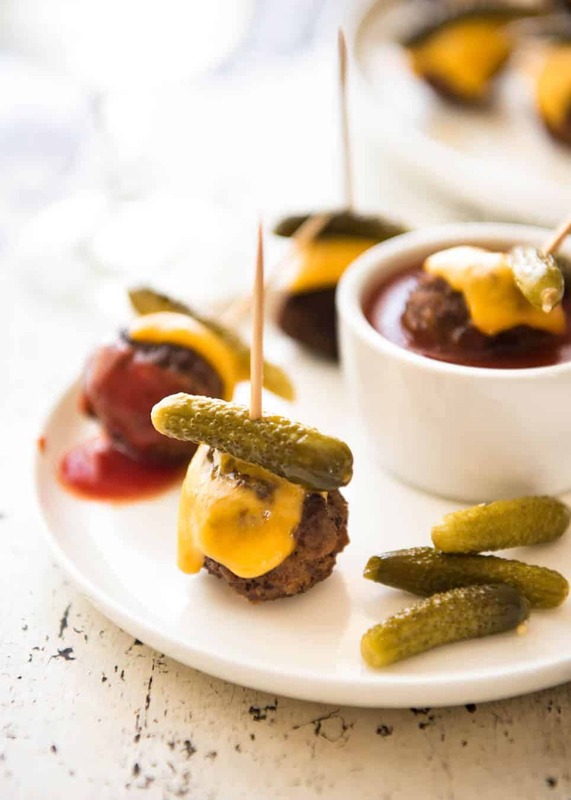 Cheeseburger Party Meatballs! 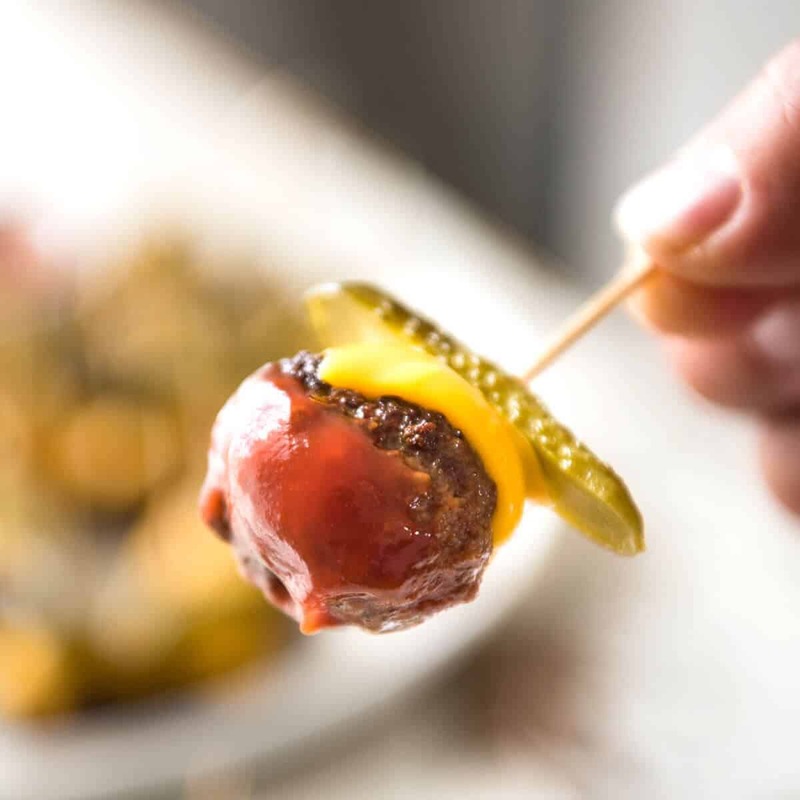 Everything you know and love about cheeseburgers – in bite size finger food form. These are great for making ahead – fully assemble them (even with the toothpicks), pack in containers and reheat for just 90 seconds in the microwave. You’ll be the hit of the party! It dawned on me the other week that I haven’t shared a fun recipe in quite a while. “Fun” being things like bite size French Toast Bites (have you tried them?? They’re fabulous – and fast! ), Mini Potato Gratin Stacks, Mini Pizzas made in Garlic Bread Cups. That sort of thing. Tasty, fun food. 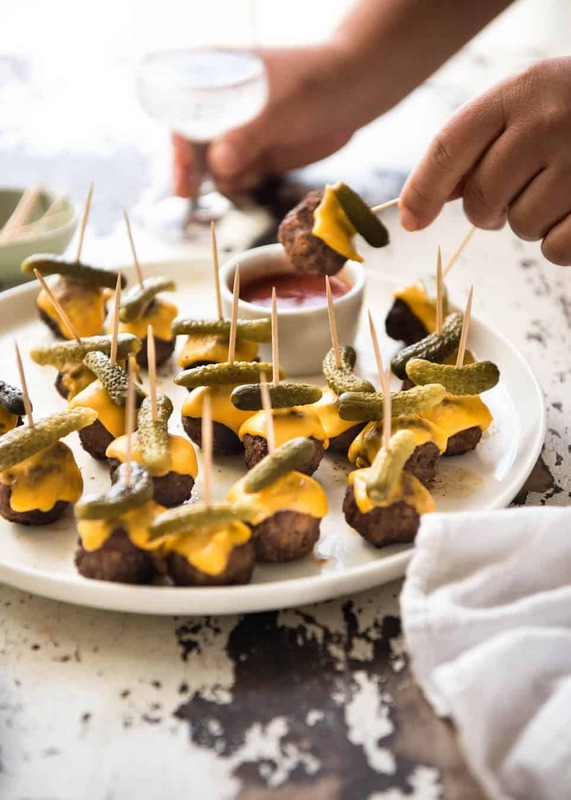 And these Cheeseburger Party Meatballs are the first thing that popped into my mind when I found a packet of beef mince in the fridge. Easy to make. I had everything but the plastic cheeseburger cheese to make it. So I made them. And inhaled way too many of them in one sitting. ? These are a real crowd pleaser for gatherings. Who doesn’t love cheeseburgers? Real homemade ones, or even (gasp, shock horror!) McDonald’s Cheeseburgers. Regular readers know that I’ve admitted to doing the drive through of shame on the odd occasion. If that’s not a sign of a total foodie, I don’t know what is. (Putting aside the fact that it was Maccers I was crying over, not something gourmet or a hearty homemade meal!!). PS I just have to share this amazing tidbit – if you’re going to have an accident, do what I did and have it 500 meters from a hospital, with my mother in her car right there, and with our family doctor coincidentally in his car at the lights. Not kidding. Truly lucky.? My Italian Meatballs are one of the most popular recipes on my site – with good reason! They’re extra juicy and extra tasty, with 2 little things I do differently that make all the difference. For those, it is totally worth making the effort to make them extra fabulous. 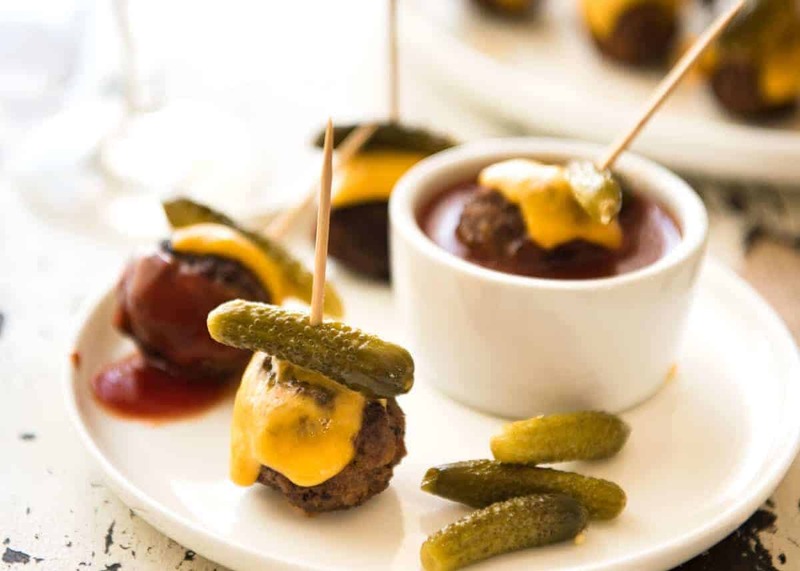 For these Cheeseburger Party Meatballs, I don’t go to such extent. I make them using a mixture like I’m making….well, cheeseburgers. ? Scoop up a heaped tablespoon and dollop onto a work surface with the flick of your wrist. Repeat with remaining mixture – scoop, dollop, scoop, dollop. Once it’s all scooped out, then roll them. It’s much faster doing it this way rather than scooping / rolling one by one. ?? 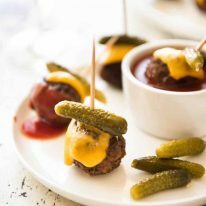 Cheeseburgers in bite size party food form! These are great for making ahead - assemble but don't melt the cheese, then when ready to serve, microwave just to melt the cheese. You probably won't have leftovers, but if you do, stuff them into rolls to make Cheeseburger Meatball subs! Place Meatball ingredients in a bowl and use your hands to combine. Refrigerate for 30 minutes (firms up, easier to handle). If in a rush, add more breadcrumbs until mixture is roll-able. Scoop up heaped tablespoons and dollop onto work surface with the flick of the wrist. Repeat with remaining mixture. Then roll into balls. Cut cheese into small squares to top each meatball. Cut larger gherkins in half, lengthwise. Heat oil in a skillet over medium high heat. Add meatballs in batches and cook, shaking the pan so they roll around, until browned all over and cooked through - 5 minutes. Between batches, drain excess oil (but keep some to cook next batch). Place cooked meatballs on a large plate that fits in your microwave. Top with cheese and a gherkin and secure with a toothpick. Microwave for 60 - 90 seconds or until cheese melts. Serve warm with ketchup! 1. I use the "plastic" processed cheese slices that are similar to the cheese you get from fast food burger places, like McDonald's. Just to make this as similar to cheeseburgers as possible! 2. Inspired by a recipe from Taste magazine. Woah! 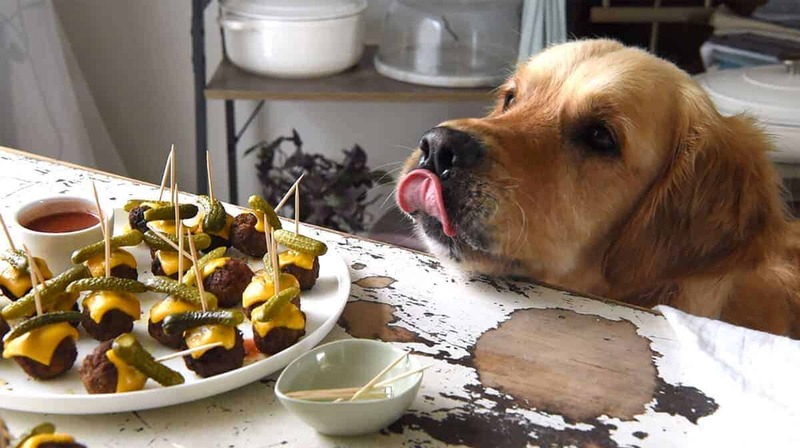 Mate, you’re WAY to close to those meatballs – back off!!! Hi Nagi! 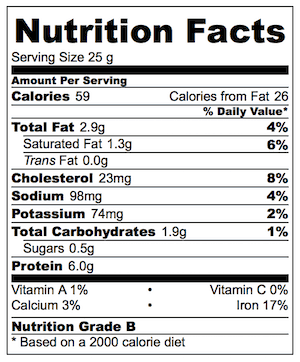 Can the meatballs also be made with ground chicken instead of beef? Thanks! PS I love your site!!! Lots of great recipes!! All I have to say is… DUDE! those are the best idea. Thank you for so many different recipies. Yeah I wondered if it was the smoked one..I remember it being really yellow but the one I had was prob a bit too smokey. ..
No way!!! OMG it might be worth doing the battle just to get the fake cheese!! I think I’ll become Dozer’s agent. All I’ll require is a share of the goodies 🙂 The appetizers look so good. I think I could make an entire meal out of your appetizers. Nope! There’s no thinking about it. I know I could. Wonderful idea, Nagi! BA HA HA!!! Agent for what exactly?? He would never be booked for jobs – he is not disciplined enough!! Oooh! I will wait to hear what you think! followed the recipe to the dot. I must say one of the better tasting recipes I have tried yet. This is such a good idea for party food!! Delicious! I’ ll join Dozer! Picture perfect! Am making parsly pesto, in freezer for later, Xmas time for salad dressing! The other day find Rocket pesto, learn abouted few Years ago from My sister. Yumi! She served with home Made pasta. And will Plant potatoes, garlic, dill. Regards, Vera. Get in my belly right now! You had me at the mini pickles. Beefy cheesy deliciousness with a pop of pickle-y goodness. Thank you for this! You’re welcome! Hope you try them one day, they are SO GOOD!! He gets to try a LOT!!! Hope you and the fam had a great weekend Mel!! Perfect timing! I was looking for an appy/snack recipe to take to work for a potluck – this is it!! Thanks Nagi, you ROCK! Glad to hear that Leah!!! And NO meatballs for Dozer – naughty dog, getting so close and breathing his stinky breath all over my meatballs!!! Lmao thanks for the tip about accidents; hilarious! I know, right??? My mum gets cranky every time I make jokes about it!!! Great stuff for scoffing! Dozer crack me up. Did you give him any meat balls? No!!! He was so naughty, breathing his stinky dog breath so close to my meatballs, he didn’t deserve any!!! Excellent video, Nagi! All I need from the directions are the ingredients, the video does the rest. btw, I hope you gave Dozer some meatballs for appearing in the movie. Gorgeous! I wasn’t sure plastic cheese was good for him……!! Hi Nagi! What a great idea! I can’t eat any fast food as it all upsets my stomach, but I sure would scarf down on these! Mini fries on a toothpick would be good with these! Have a great, relaxing weekend! Ooh, yes to adding fries to this!! I should have thought of it ? ?